I am on my travels now and have been in Montreal since the middle of June and it has been nice. This is the first time I have taken a full month off since 1989! I have been here by myself aside from separate 2 day visits from both my son and daughter. My wife is joining me this weekend just in time for the International Jazz Festival but in the mean time I have had lots of free time for gaming pursuits. I had some rebasing to do for some 18mm Napoleonics as well as painting some figures to supplement my French Indian War forces. 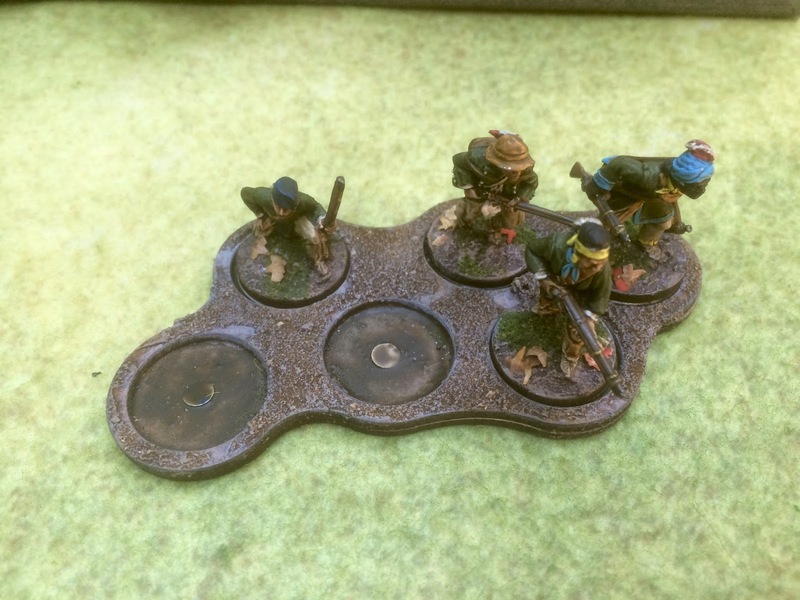 I have also almost finished the cart set from Warbases UK for Sharp Practice 2. 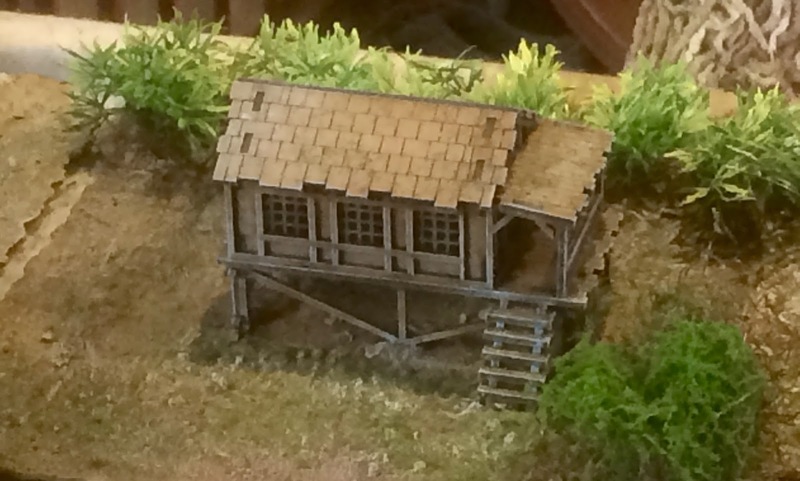 Lovely models, I am surprised they work so well in mdf. Some photos will be forth coming soon. I have also got in a couple of games at my friend's Iannick's new house in the suburb of Ahuntsic. Iannick now has a purpose built games room, a painting room and an office! I am not sure how he got away with it, but he is certainly all set up now. He really has collected a lot of stuff over the years and now it is all easily accessible. 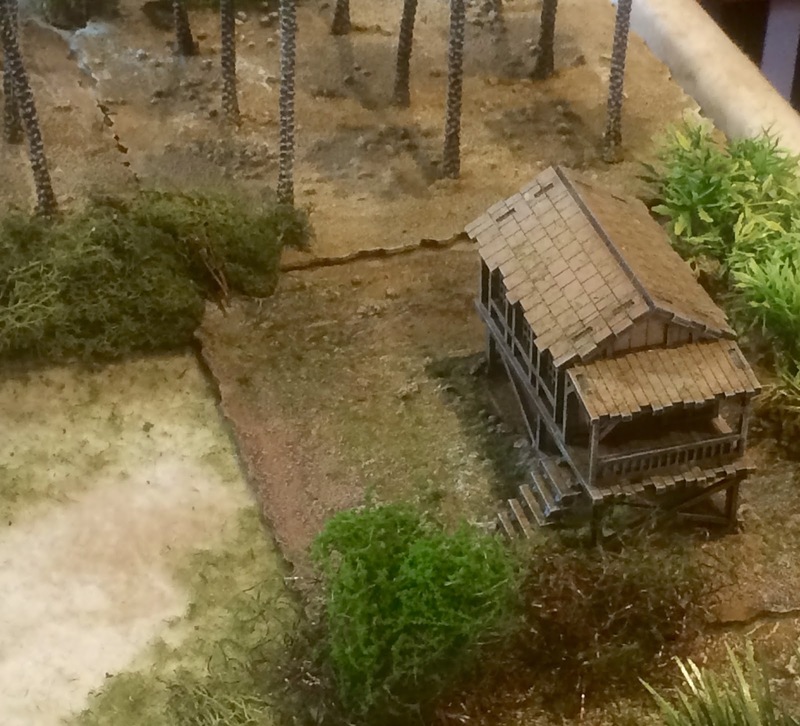 Our first game was a week ago, and for this Rusti of Crossover Miniatures drove up from Northern Vermont. 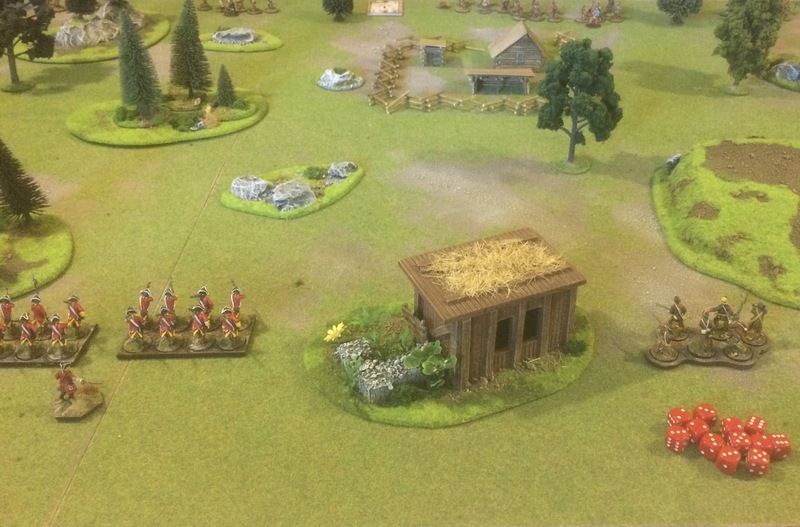 I exerted a bit of pressure and got them to playtest the Napoleonic rules based on Chain of Command from Darren Green, the author of the Le Feu Sacre ruleset. I suspect that neither of them were that keen to play Napoleonics but both are experienced wargamers and I needed to broaden the number of people who have play tested them. I acted as the referee. 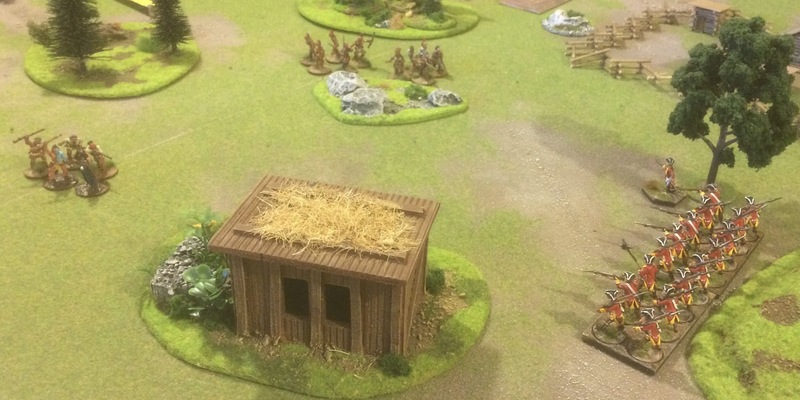 We played the Albuera scenario I had written, this was the third go with this scenario. I like it as it has a good mixture of infantry, with one side having a preponderance of cavalry. We have found this useful as it forced one side's infantry to go into square and it seemed that these rules were little tested. 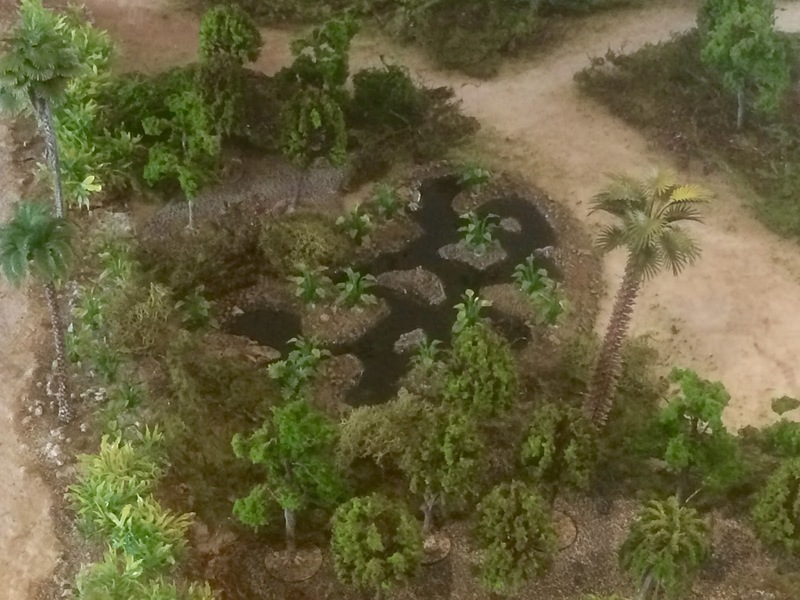 It also has 3 brigades per side which is really the maximum the command system in this ruleset can tolerate. Rusty took the French and Iannick the Allies (who would of thought that). 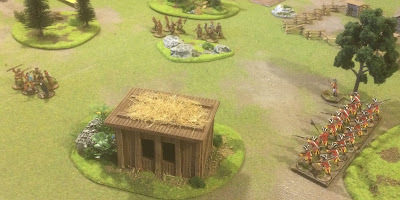 I did not take a lot of photos, nor to I plan to write an Action Report, I was really focused on giving the rules a run with a new set of gamers. Things went relatively well, and I only made a couple of errors in refereeing the game. I think I have a relatively good grasp on the rules now. I did make some minor changes to the scenario as written above. The British have to start in march column with there rearmost bases touching the northern edge of the terrain. 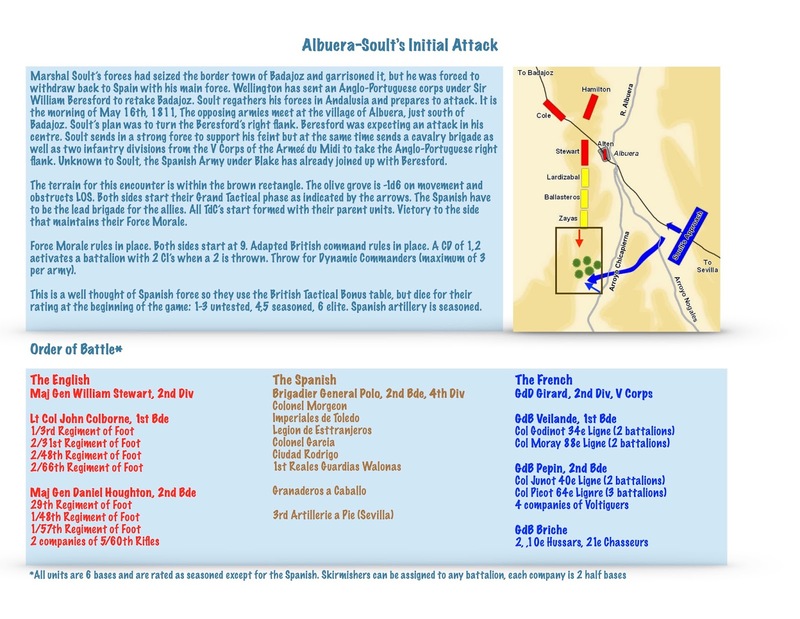 This was an attempt to duplicate the historical conditions of the action, where the British forces were caught out by Soult's feint to the centre and had their left flank protected by only their Spanish allies. On to some photos. Looking south from the northern edge of the terrain with the two British brigades rushing to their left flank. 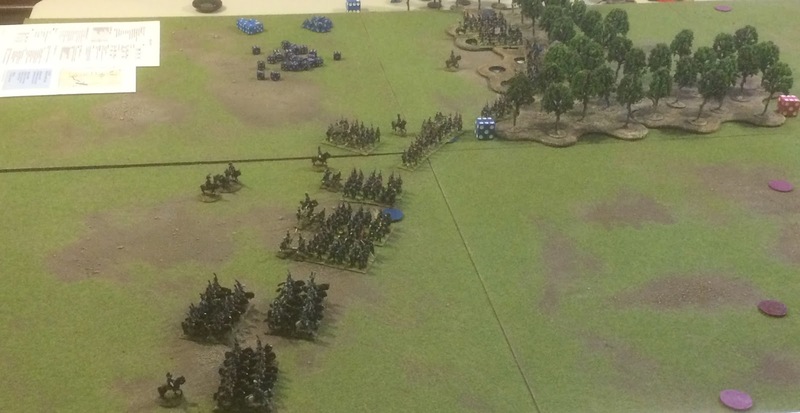 The Spanish started the game in attack column with their artillery to their right flank and their cavalry in reserve. 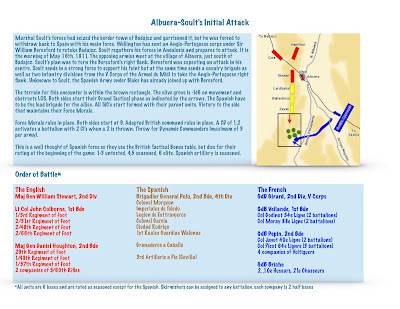 As per the scenario rules the class of the Spanish troops was unknown until they went into action (1-3 untested, 4,5 seasoned, 6 elite as thrown on a d6). All the French and British troops were seasoned. As you can see Iannick elected to hold back his troops from their front line (the red discs laid down from the patrol phase). Here we have the French initial set up, Rusti was more aggressive bringing all his units up to his picket line. The cavalry brigade on his right flank with a infantry brigade in the centre and another infantry brigade going through the olive grove on their right flank. Again all in Attack Column except the brigade going through the olive grove which were in line. Well how did the playtest go? The players had no problems with the patrol phase and were satisfied after one go, I did offer to replay it. We played for 3 and 1/2 hours and although the game was not brought to conclusion we did get a lot of play in. 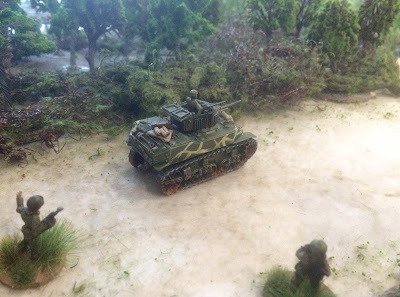 The basic mechanisms of movement, firing and combat as well as combat resolution, unit morale and force morale were all easily learned (it is easy with a referee). 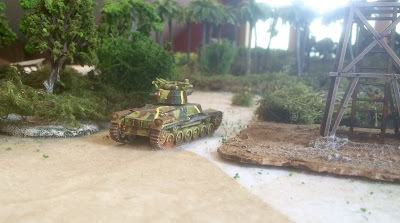 As it was a first game they had some difficulties getting to use the tactical bonuses (although I should say very few 5's and 6's were thrown), aside from the interrupt. 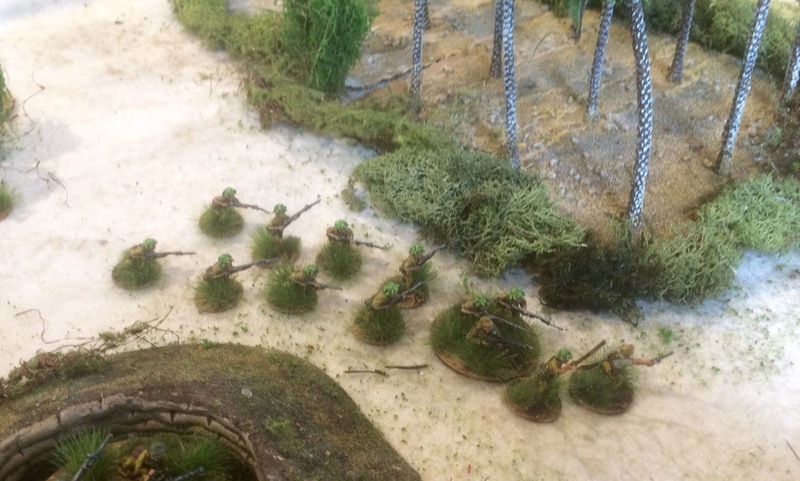 They generally did well with movement by directing battalions, but no one seemed to be able to set themselves up for passage of lines (one of my favourite rules). 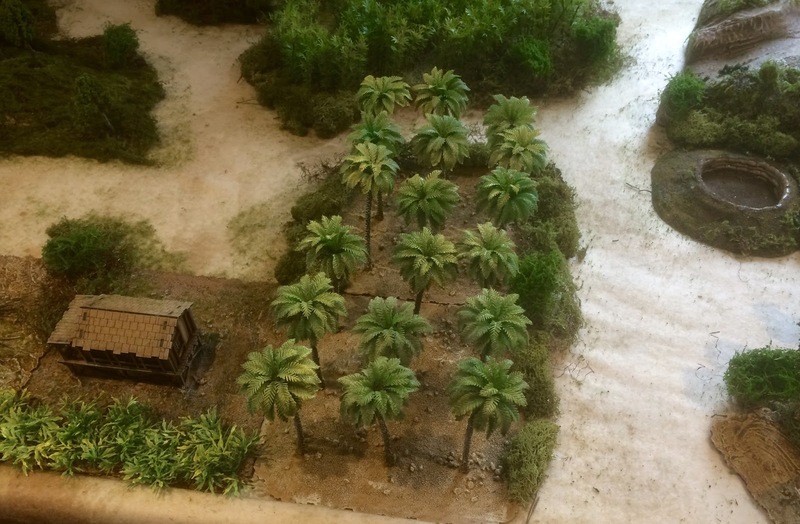 They also seemed to have little problem with attribution of command initiatives and utilizing the command dice. I use d4's to help with this but they seemed to find it unnecessary. 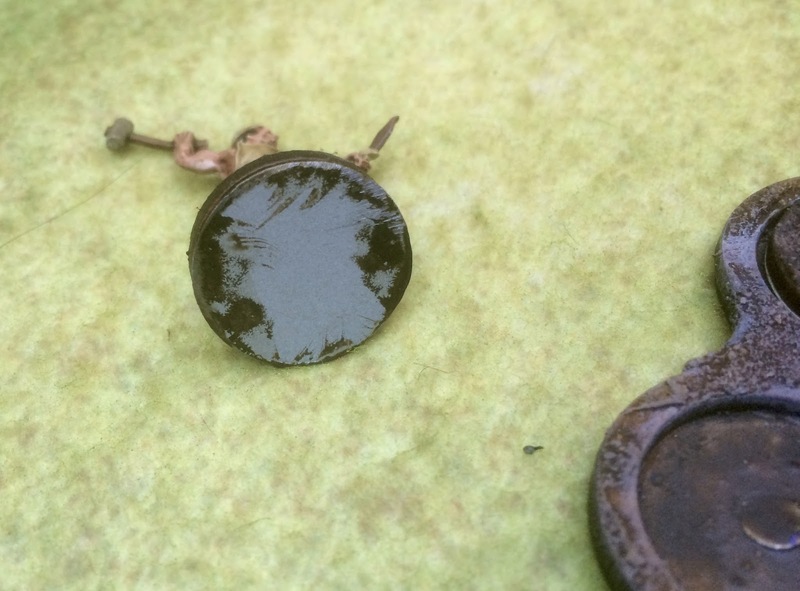 One suggested that chits be used instead, maybe not a bad idea. We decided to call the game at 11pm, I think the Allies probably would have won but it was a well fought game by both players. Well what did they think? I believe both of them were not really that impressed with the ruleset. They were some big reservations in respect to base removal and the size of the units, but really this is a personal preference and really has little to do with the ruleset. I personally like rulesets with base removal and variably sized units. 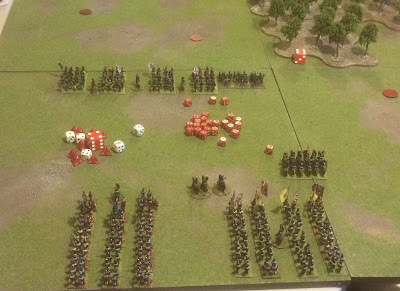 I can see problems with rulesets scaled at the grand tactical level when this is the case but at the battalion level a diminishing footprint works for me and as I like to refight historical battles variably sized units is a necessity especially in the Napoleonic era. So I dismiss these reservations without hesitation. 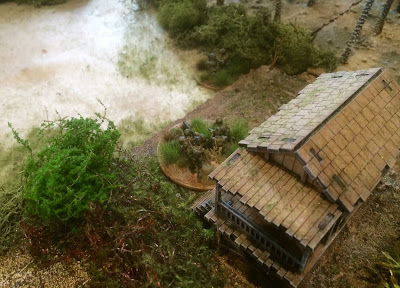 One also complained about skirmishers, but coming from the Sharp school of wargaming, I also dismiss this out of hand. I like skirmishers! Other questions raised have come up before and less easily dismissed. Variable Movement: Almost all TFL rules have variable movement, i.e. 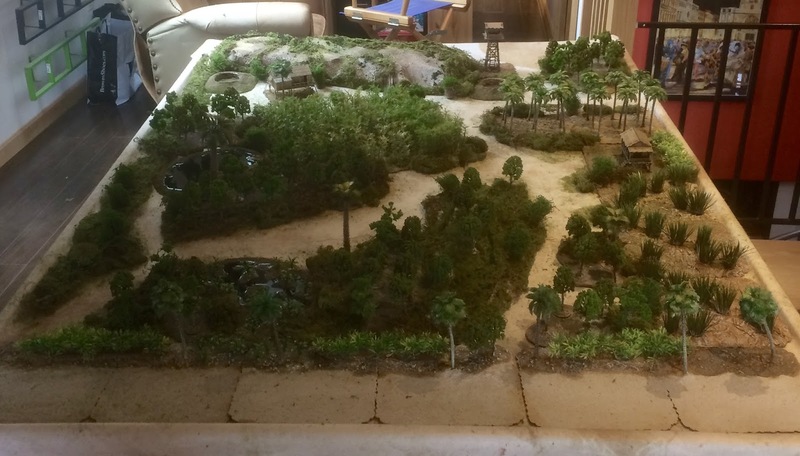 3d6 (in column) if no restrictions on terrain or formation and 2d6 (in line) or 1d6 if adverse terrain or maneuvering. 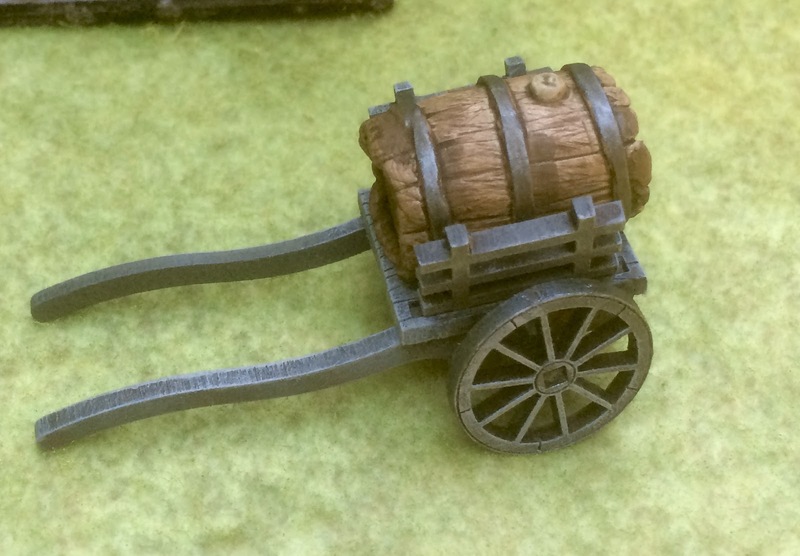 This gives a range of 3-18" of movement with 3d6. This makes it easily remembered, as you remove 1-2 d6 if you move through rough ground or are changing from column to line etc etc. I like this but almost everyone (3 groups) to whom I have introduced the game dislike it. It is hard to get rid of though as the the whole movement/maneuver mechanic is dependent on it and is very easily remembered. One of the other testers on the Yahoo group suggested that for movement one could substitute AvD (average dice). So still using 3 dice the range of movement would go from 6-15" now. The more I think about this the more I like it, although I can here the complaints about having to use AvD. Weakness of French Tactical Bonuses: Another constant refrain in respect to the Peninsular Bonuses, Huzzah (fire and charge can be vicious) but there is not even a close French equivalent in effectiveness. I have suggested that En Avant (4d6 of movement) be substituted with Pas de Charge (4d6 of movement + 2 shock on each enemy unit contacted). 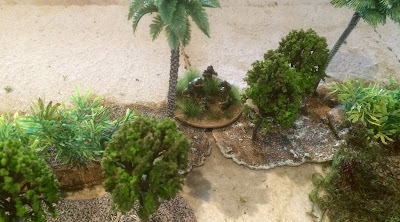 It has been argued and maybe fairly that historically the thin red line did not wilt under attack from the French Attack Columns but even if so it does seem a little unfair to refuse to even the score for gaming purposes. Number of Command Initiatives: It has been suggested that the number of command initiatives available each turn is slowing down the game because of their cascading nature (a Divisional General can hand down 1CI to a Brigadier General who now has 3 CI's). It has been suggested that the cascading CI's be -1 (so the above transfer would result in 2 CI for the Brigadier rather then 3) to decrease the overall initiative number. I think this is reasonable, the command structure and activation (the 5 Command Dice like CoC) is a critical part of the ruleset and I would not like to see it go. We tries this in the game, but really the players were not conversant enough with the ruleset to appreciate or analyze this change. 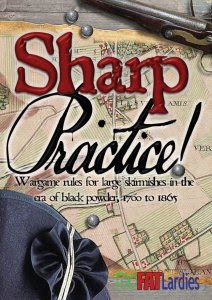 So an intersting playtest and the most negative evaluation to date, but I still like this ruleset and really none of the other 5-6 Napoleonic rulesets I have tried, have attracted me as this one does. So I will soldier on, but will try the above 3 amendments in my next playtest. 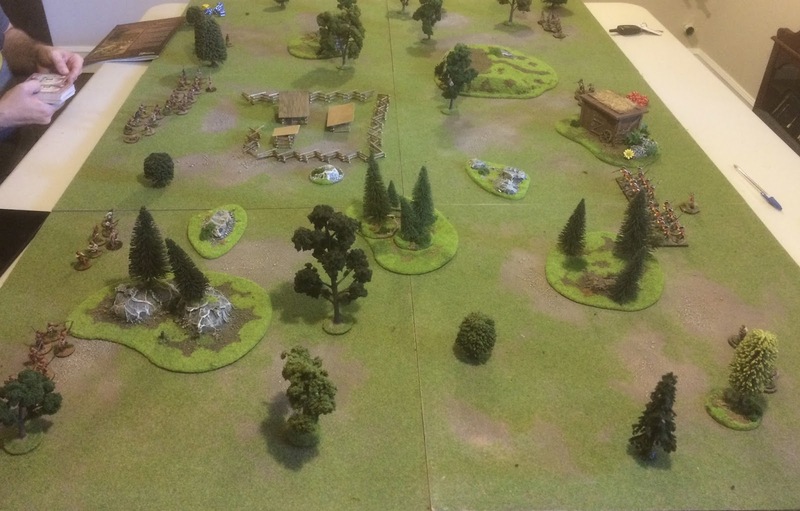 Last Saturday, I sat down with Iannick and we had a game of M&T, this is probably the 3 or 4th game (but not for a couple of years) of the French Indian War with this ruleset and they are enjoyable and relatively easy to play. Unfortunately I had not realized that we would be playing this game, so did not have my rulebook with me and the rules were a little rusty, but the game flowed smoothly. It is interesting in that this was probably one of the first skirmish games I played and I subsequently have played a lot of Dux Britianarium and Chain of Command, both from TFL. As noted it is a good ruleset and gives a good game with lots of drama as the units of men are activated on card initiative, which I certainly like. The movement and firing mechanisms are quite simple and are reasonable. I found combat a little tedious as it has up to 4 steps; throw dice to hit, throw dice to confirm, if you lose throw more dice to see what happens and if something bad happens throw even more dice to see if more men die. Each of these steps has a number of modifiers so it can get a little complicated. French allied Indians are quite brutal, they get to re-throw all misses in combat so you want to kill them before they get close. I also found it strange that British regulars in firing line have normal movement. 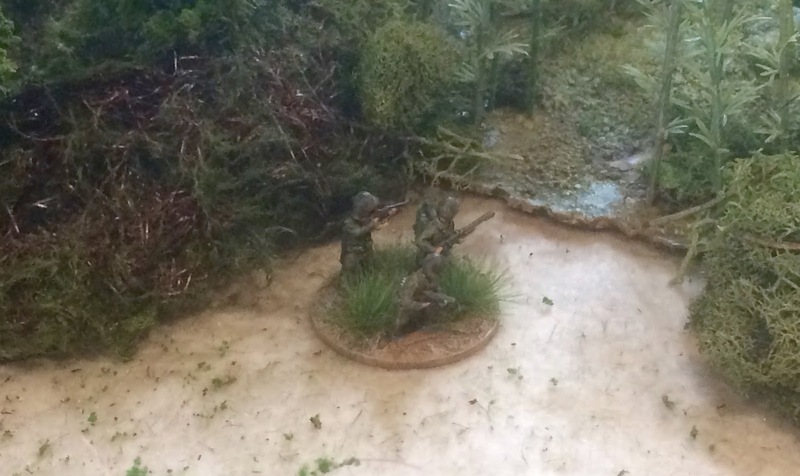 Another odd thing is despite it being a skirmish game in combat each man only engages one enemy. 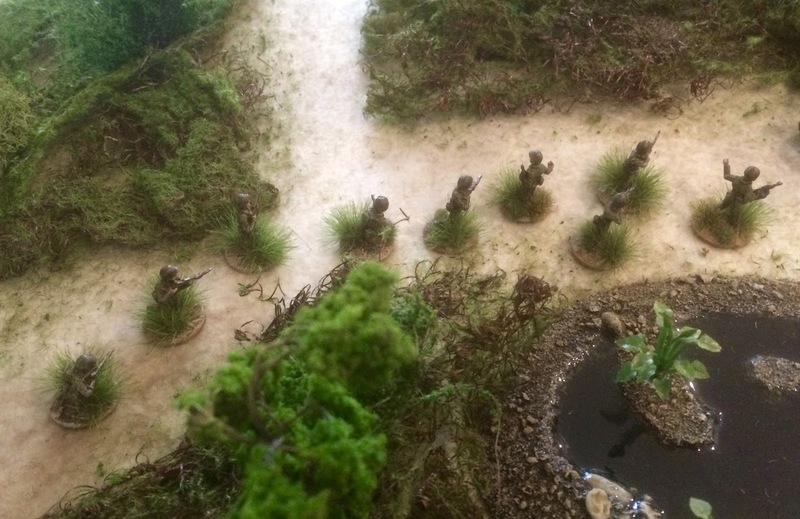 So if 6 indians attack 16 regulars only 6 figures on each side are involved in each combat. I have to admit I think we may have had this wrong, but if it is the case it is odd. Overall though, we had fun and the game was over in a couple of hours which is nice. 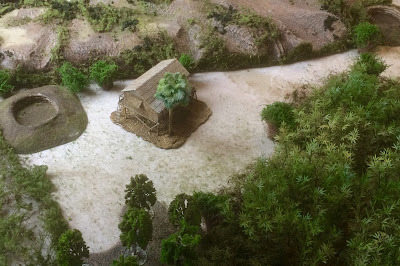 We are hoping to have a game of SP2 in the FIW setting in a week or 2, it will be interesting to compare the rules. Anyway some photos to follow. 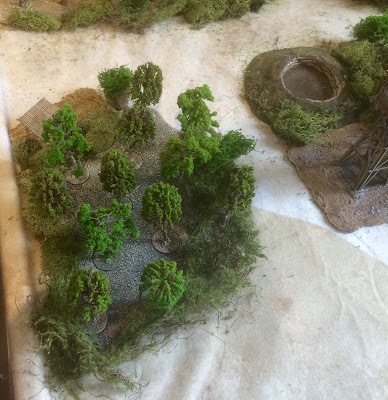 Iannick has some lovely terrain which gave us a good game. 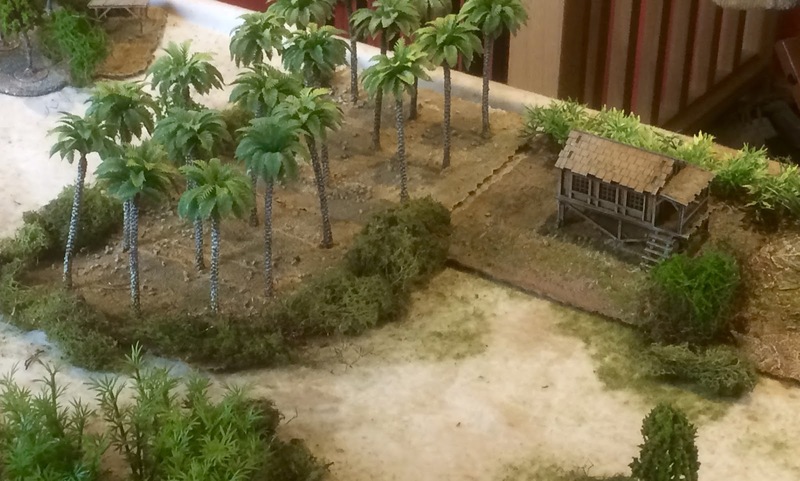 I believe he fielded 4 units of Indians and 1 of French militia. 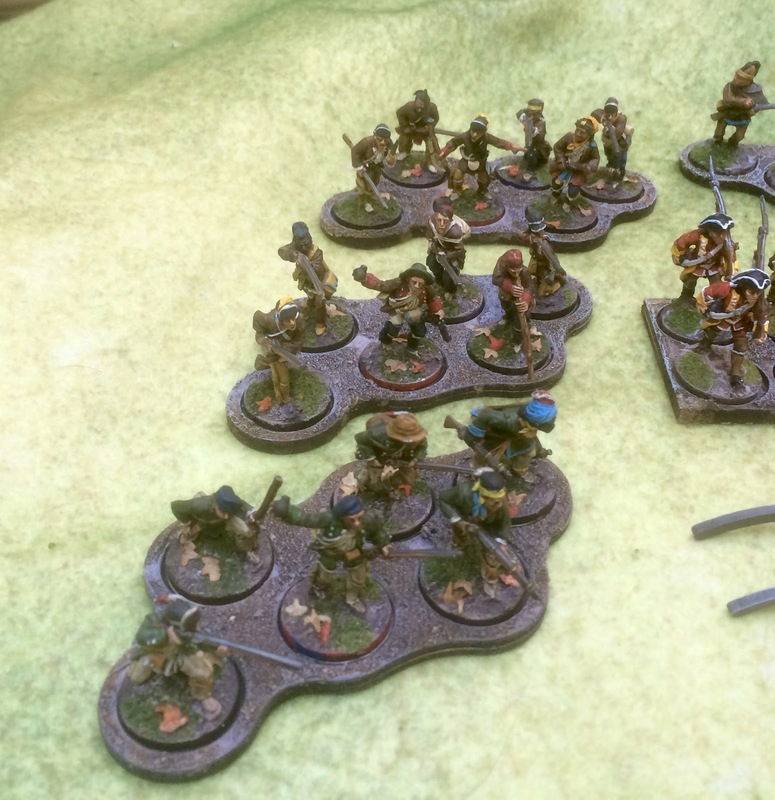 I fielded 2 units of Rangers, 1 of Indians as well as 2 of British regular infantry. 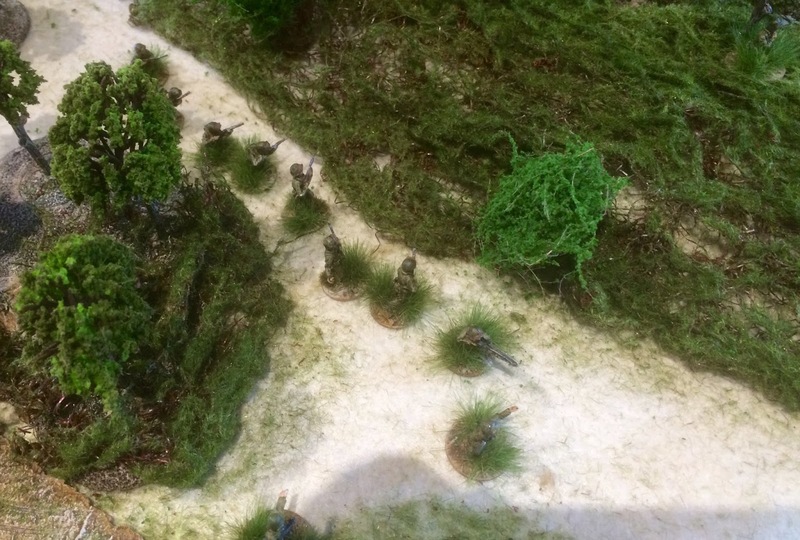 I kept my regulars in the middle in firing line. 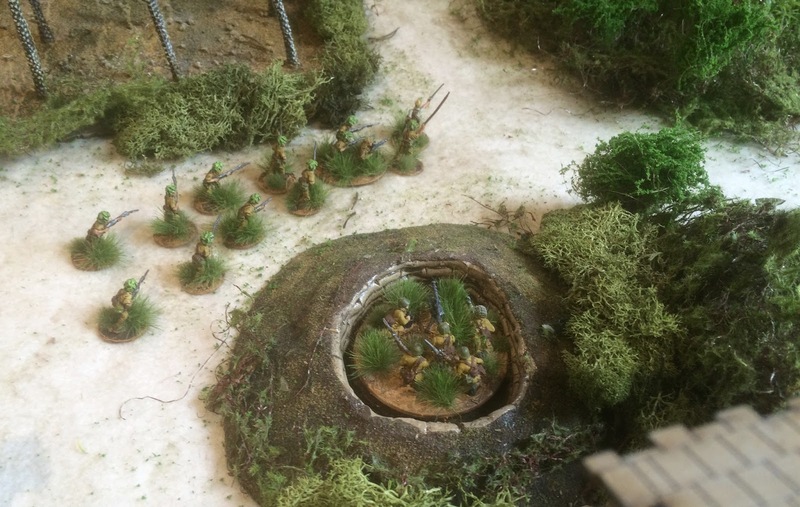 The Rangers ascend a hill which gives them lots to fire at. 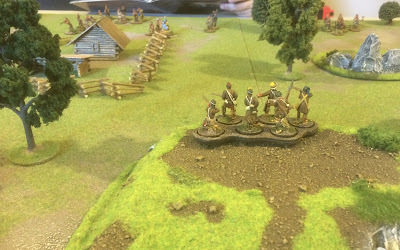 Near the end of the game, we had both lost a lot of figures but Iannick sent his 3 remaining units of Indians in to attack my British Regulars who really had yet to see action. Unfortunately I left the officer out front, who was almost immediately taken out by the rapidly moving Indians. 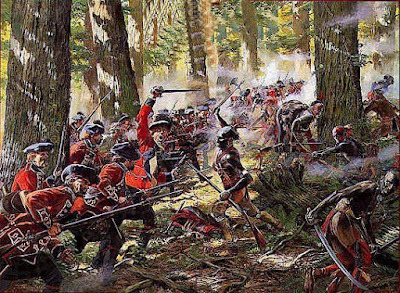 The card draw favored the French and before I knew it they were on top of my British regulars, I had whittled them down to 6 but they were still quite ferocious but I was eventually able to fight them off. It was a fun game. 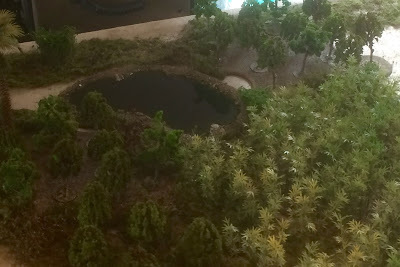 I started putting this terrain together about 6 months ago, it certainly is the biggest terrain project I have taken on and the most difficult. 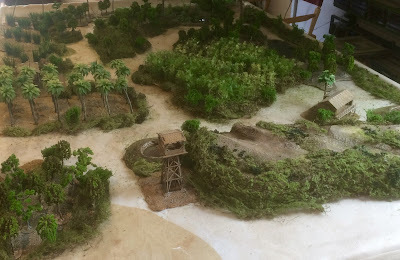 I really am not a big planner, I wanted something that I could use for an early pacific island campaign (Guadalcanal) and also something maybe in Malaya in case I wanted to paint up some Australians. Aside from that general want, there was no plan. 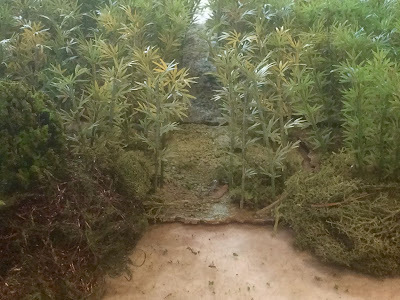 I see a piece of terrain and say that will work and I then have to fit it in. I had a general sense that I wanted a beach, a jungle and something to attack. I knew that unlike Normandy or Finland this would have to be very dense. Line of sight would be continuously blocked, but I wanted winding pathways through the jungle. 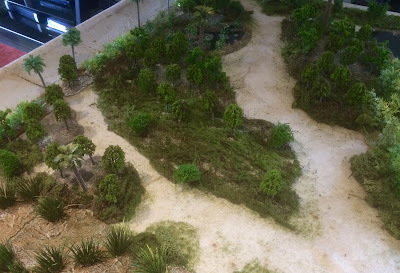 I also wanted lots of different types of terrain. 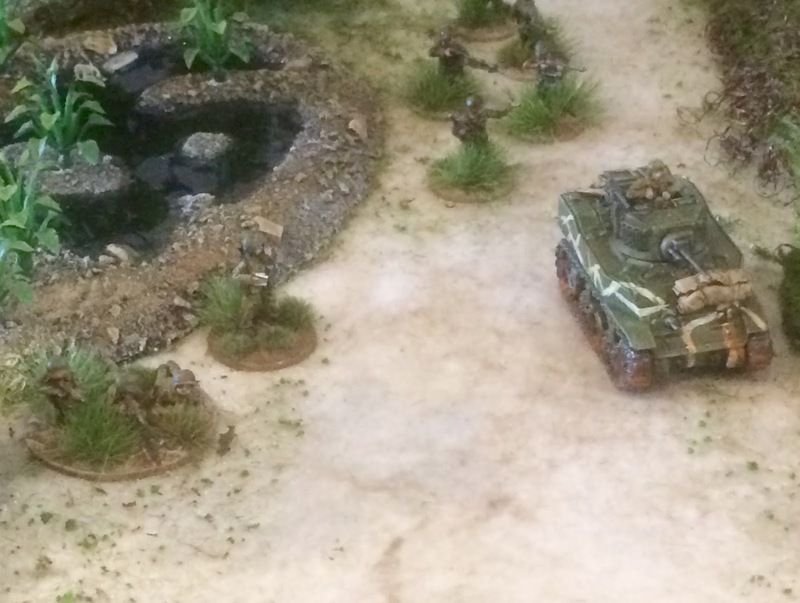 Chain of Command is a terrific game and it caters well to varying terrain. 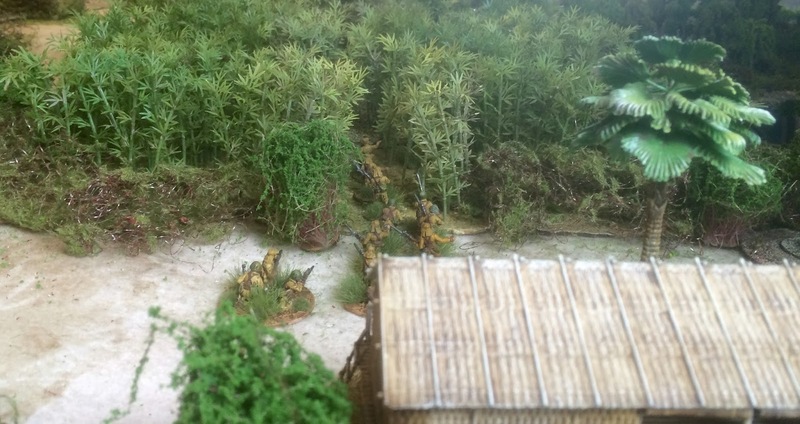 The TFL 2015 Xmas Special had a superb Malaya campaign. The author Len Tracey had done a fantastic job of putting together some special rules for fighting in jungles. 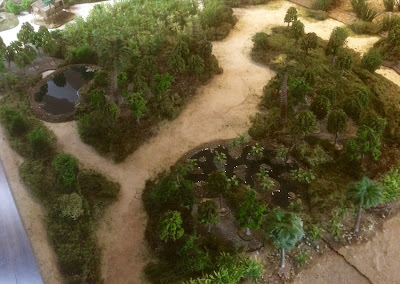 Terrain types included were primary and secondary jungle, kunai grass, bamboo copses, swamps, plantations and jungle huts. For each of these types of terrain, he defines movement and LOS, as well as cover. This information gave me a general outline for planning as I went along. 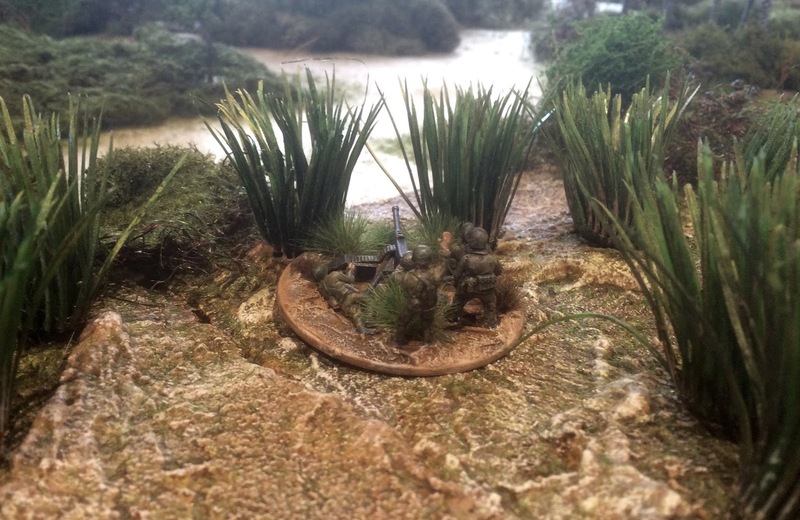 A lot of the terrain pieces were designed to be affixed to tiles of mdf. Unfortunately it is impossible to get thin mdf in the US, Simon of Big Red Bat Cave was great in suppling me with nice pieces from the UK. The mat is the from Cigar Box and is their dessert one. I used used liquid wood to give the tiles texture adding some small rocks and sand. The palm trees on the beach are from Pegasus but they are enormously expensive. After buying 6 of them, I decided to do some searching on the internet and found that you can get excellent trees from China on eBay at a fraction of the cost of suppliers in the US and Europe. Shipping is very inexpensive. 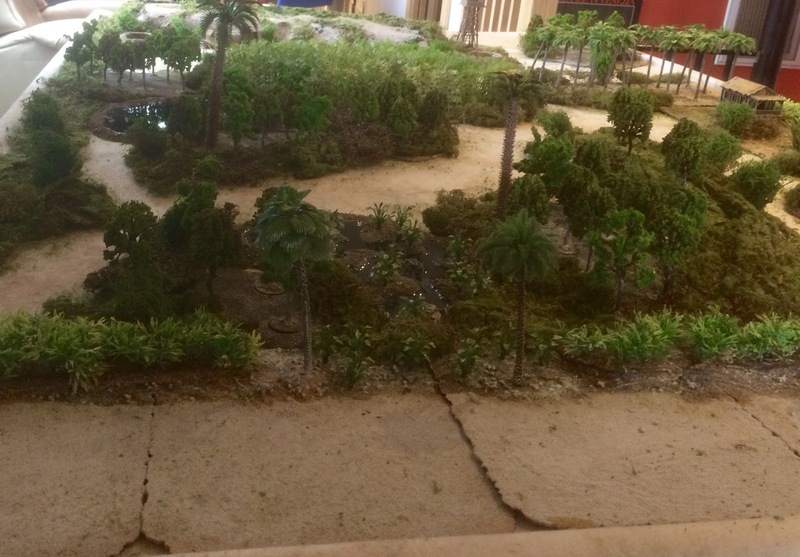 I believe I used 2 different types of palm trees, bamboo trees, 3 different types of regular trees, swamp plants and bushes from Chinese suppliers. A jungle hut from Sarissa Precision. 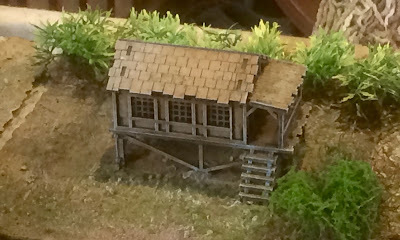 This hut is from their 15 mm line, a little small for 20 mm gaming but it will do. 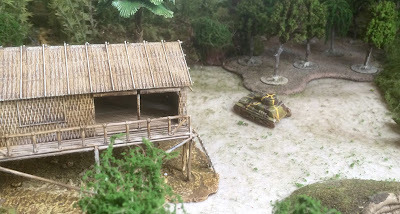 Another hut this time from Airfix. 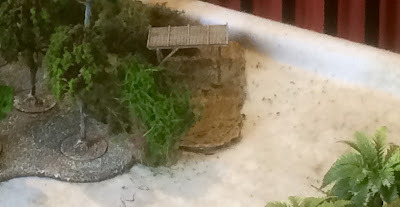 I am not sure where I got the sand bunker from. 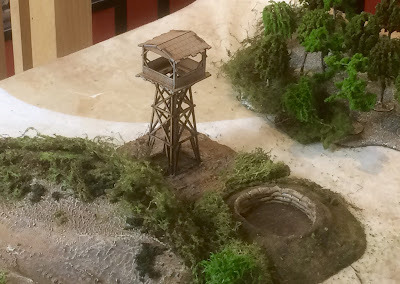 A watchtower also from Sarissa. Three different tree types from China. The tree bases are from Adventure Terrain and are magnetized. Very clever. The tre bases will represent primary jungle for gaming. 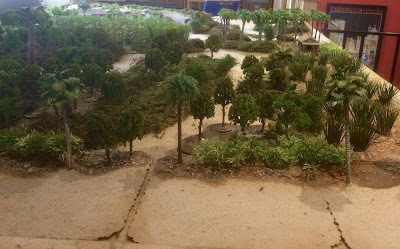 I wish I could have found some rubber trees as well, but a copra plantation is good. Well this was a lot of work, but I am happy how it came out. 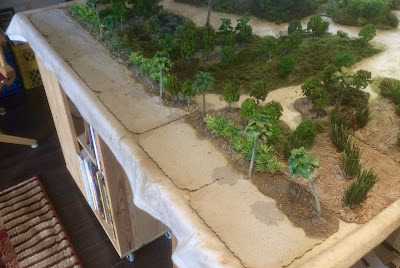 I still have to decide how I am going to terrain the paths, I will probably just lay down some reddish sand. 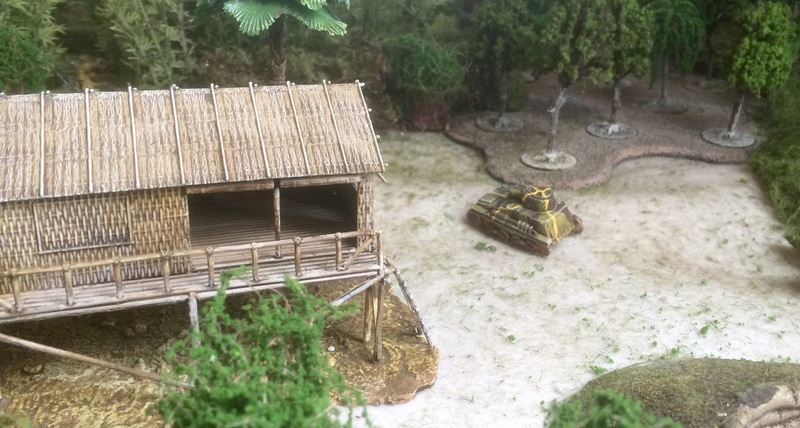 Still have 2 more sections each of USMC and Japanese to paint as well.